In April-May we have received a range of publications that we feel will be of interest to New Mandala readers. 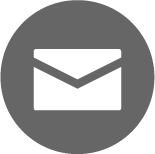 Selected 6 titles are presented with cover images. The first is р╕Щр╣Йр╕▓р╣Ар╕ер╣Ир╕Щр╣Др╕Я (Nam len fai) by longstanding and well known novelist, р╕Бр╕др╕йр╕Ур╕▓ р╕нр╣Вр╕ир╕Бр╕кр╕┤р╕Щ (Kristsana Asoksin). The novel won the Outstanding Fiction Award under the Outstanding Books Award of the Year 2011. The award is provided by р╕кр╕│р╕Щр╕▒р╕Бр╕Зр╕▓р╕Щр╕Др╕Ур╕░р╕Бр╕гр╕гр╕бр╕Бр╕▓р╕гр╕Бр╕▓р╕гр╕ир╕╢р╕Бр╕йр╕▓р╕Вр╕▒р╣Йр╕Щр╕Юр╕╖р╣Йр╕Щр╕Рр╕▓р╕Щ (р╕кр╕Юр╕Р.) р╕Бр╕гр╕░р╕Чр╕гр╕зр╕Зр╕ир╕╢р╕Бр╕йр╕▓р╕Шр╕┤р╕Бр╕▓р╕г (the Office of the Basic Education Commission, Thailand Ministry of Education). 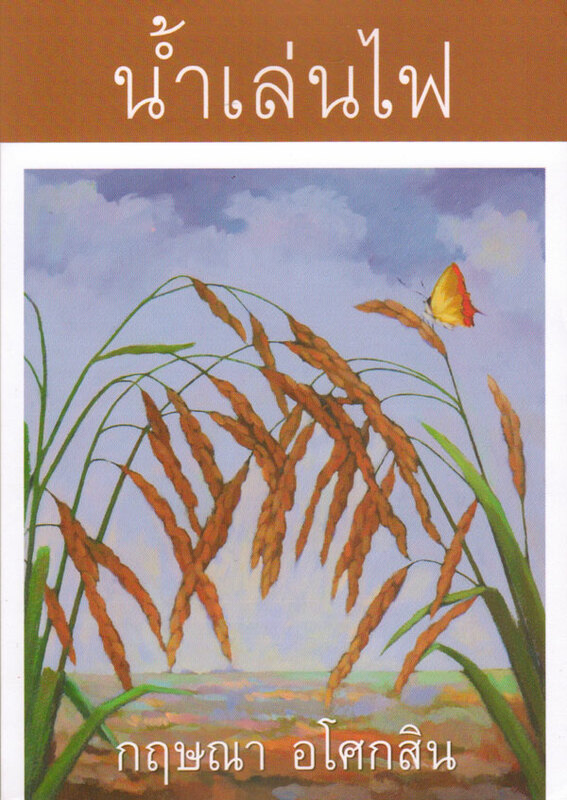 The story illustrates the application of sufficiency economy ideals in a fictional world. Here is a review (link) by the Office (taken from Sakun Thai magazine, no. 2944, March 2011; p. 51). The second is р╕нр╕ар╕┤р╕кр╕┤р╕Чр╕Шр╕┤р╣М р╣Ар╕зр╕Кр╕Кр╕▓р╕Кр╕╡р╕зр╕░ р╕Бр╕▒р╕Ъ р╕Юр╕гр╕гр╕Др╕Ыр╕гр╕░р╕Кр╕▓р╕Шр╕┤р╕Ыр╕▒р╕Хр╕вр╣М (PM Abhisit and Democratic Party) by р╕Ър╕╕р╕Нр╕Кр╕▒р╕в р╣Гр╕Ир╣Ар╕вр╣Зр╕Щ. The volumes consist of brief biographies of 7 previous Democratic Party leaders; the majority of the volume is dedicated to PM Aphisit and his political life up to the present, in particular his relationship with key people who have direct roles in supporting him and his party. The third is р╕ир╕╢р╕Бр╕Кр╕┤р╕Зр╕нр╕▓р╕Ур╕▓р╕Ир╕▒р╕Бр╕гр╣Бр╕кр╕Щр╕ер╣Йр╕▓р╕Щ: р╣Бр╕Юр╣Йр╕гр╕▓р╕Ър╕Др╕▓р╕Ъ р╕лр╕гр╕╖р╕нр╕гр╕нр╕Др╕нр╕вр╕Чр╕зр╕Зр╕Др╕╖р╕Щ? : р╣Ар╕Вр╣Йр╕▓р╣Гр╕Ир╕Ыр╕▒р╕Нр╕лр╕▓р╕Чр╕╡р╕Юр╕╡р╣Др╕н р╣Ар╕Вр╣Йр╕▓р╣Гр╕И р╣Ар╕ир╕гр╕йр╕Рр╕ир╕▓р╕кр╕Хр╕гр╣Мр╕Бр╕▓р╕гр╣Ар╕бр╕╖р╕нр╕Зр╣Др╕Чр╕в (The battle of hundred millions empire: a complete defeat or waiting to return? 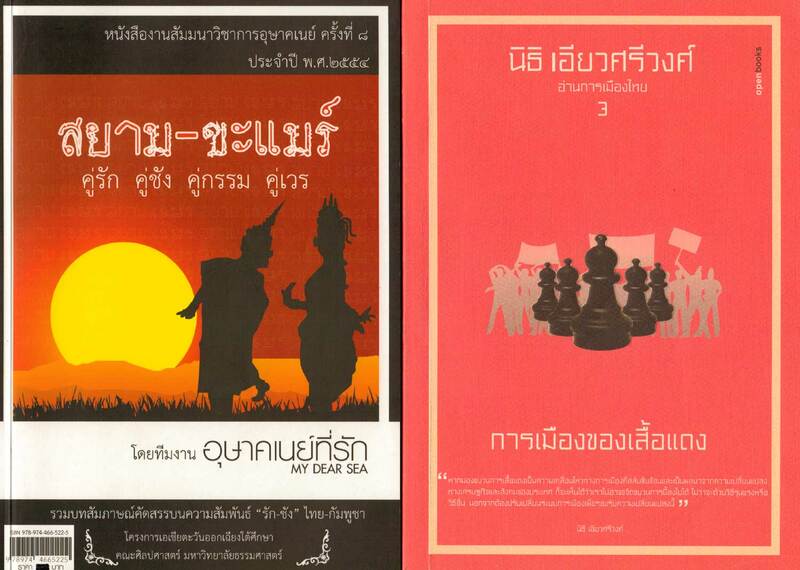 : Understanding TPI problem and understanding Thai political economy) by Charin Chaemsakhon. 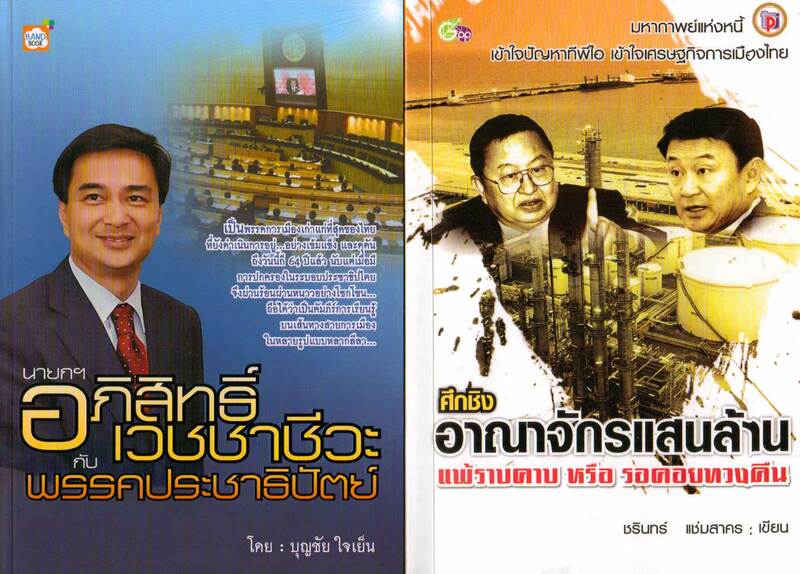 This book traces back to the beginning of TPI (Thai Petrochemical Industry) and its history before it became known as the Integrated Refinery and Petrochemical Company (IRPC) in 2006. This 192 page volume provides a useful chronology about the ups and downs of one of Thailand’s business empires. It is easy to read and follow, clearly aimed at general readers, and it can be used as a quick reference for readers with limited background about the case. The only drawback is a lack of proper citations, though this is not unusual. Having said that, the author provides sources of information (mainly from newspapers) throughout the volume. The fourth, р╕кр╕вр╕▓р╕б-р╕Вр╕░р╣Бр╕бр╕гр╣М : р╕Др╕╣р╣Ир╕гр╕▒р╕Б р╕Др╕╣р╣Ир╕Кр╕▒р╕З р╕Др╕╣р╣Ир╕Бр╕гр╕гр╕б р╕Др╕╣р╣Ир╣Ар╕зр╕г , is a collection of interviews with scholars and other professions conducted during a seminar on Siamese-Khmer relations up to the present day, organised by the My Dear SEA team and run at Thammasat University. The discussions are wide ranging (the TOC is included in the NLA record). The fifth is a set of three volumes called р╕нр╣Ир╕▓р╕Щр╕Бр╕▓р╕гр╣Ар╕бр╕╖р╕нр╕Зр╣Др╕Чр╕в (Reading Thai Politics), collected articles by Nithi Ieosiwong from his Matichon column (2008-2010). And the last is р╕кр╕┤р╕бр╕бр╣Ир╕зр╕Щр╕Лр╕╖р╣Ир╕Щ (The Hidden Treasures for Children) by р╕нр╕╣р╣Ир╕Чр╕нр╕З р╕Ыр╕гр╕░р╕ир╕▓р╕кр╕Щр╣Мр╕зр╕┤р╕Щр╕┤р╕Ир╕Йр╕▒р╕в. 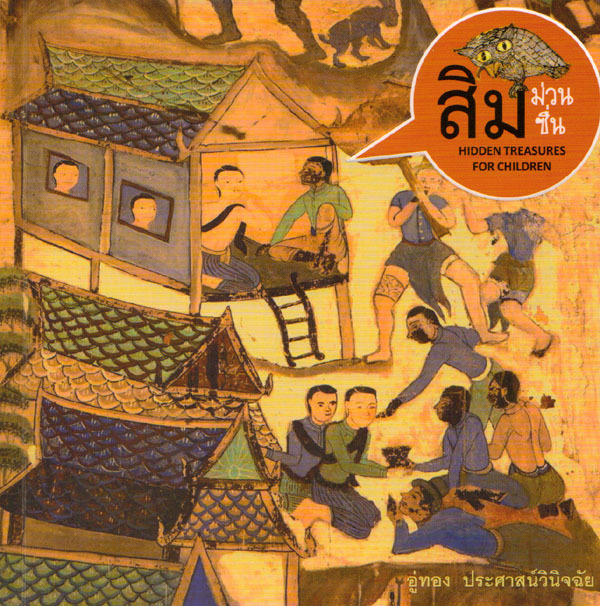 An anthology of murals from 20 temples from 9 provinces of Isaan, designed for young readers. 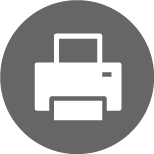 Images are reproduced and explanatory commentary provided. The pictures are really beautiful, often realistic, and sometimes quite earthy. The final image below is taken from the same book.